Seven Day Sour, Vert Gueuze made its appearance on the beer scene, and prompted a very spirited discussion on what makes a gueuze a gueuze. 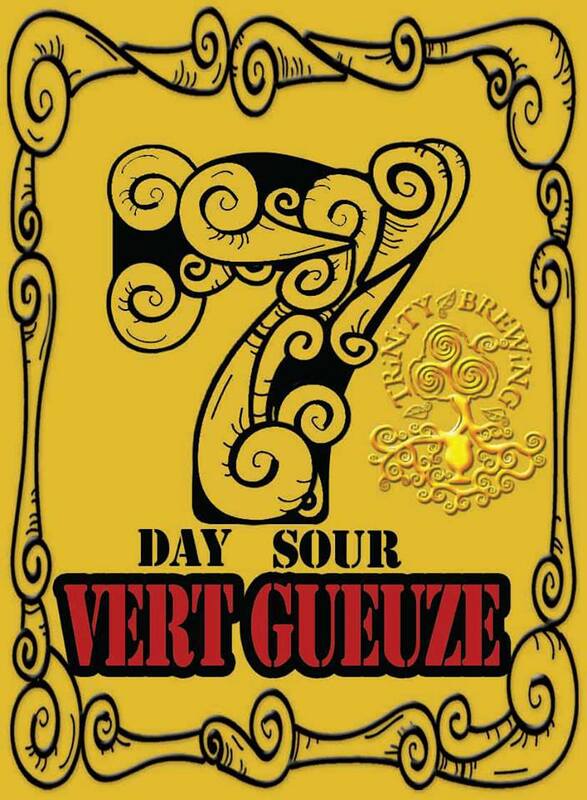 Trinity Brewing’s roster for the month of July includes the release of Seven Day Sour Vert Gueuze. Brewer Jason Yester mentioned the process (of creating a sour beer in a very short amount of time) to me when I saw him in Portland. So now that Trinity has this beer set to release this Friday, July 12th, I thought I’d ask him more about it. I’ve included his email response below. Essentially in this procedure, the process and atmosphere that allows for lactobacillus, a souring bacteria in beer, is heightened and the bacteria does its job in a significantly shorter amount of time, creating a beer that has significantly higher acidity than other beers. In fact, Jason says this beer rivals Old Growth in puckerability, and Old Growth is certainly one of the most tart and sour beers I’ve had. Jason said the inspiration from this comes from, in addition to the joys of experimentation and science, hearing bars regularly ask for a sour beer on tap. Due to the nature of sour beers, it’s not easy to have them on tap regularly so perhaps this procedure could fulfill a few publican wishes. I call ‘7 Day Sour,’ a Vert Gueuze which for lack of better terms means ‘Young Gueuze.’ …I decided to develop a technique that actually promotes and takes care of the bacteria. After collecting our wort we keep it warm in the kettle for three days and add a pitch of Lacto (pre boil/hops). The hotter temperatures really encourages growth of the bacteria, production of acid (sour), and a dramatic drop in pH. Lactobacillus is also very sensitive to hops, and adding the pitch of Lacto pre-hop ensures that no harm will be done to the bacteria. With this technique I’m able to produce a pH as low as aging a sour a full twelve months on oak. After three days of hot fermentation we do our boil and add hops, after the boil we pump the soured wort into our Fermenting Vessel and do a four day cool fermentation with a blend of 95% Brettanomyces and 5% Lacto (we reintroduce the Lacto post boil in case anyone wants to age the beer). With these new and highly precise techniques we literally produce a batch of sour beer in 7 days. When I say sour, you need to think extreme pucker, the palate of this beer rivals that of our Old Growth! Although ‘7 Day’ will not be aged on oak, I do need to mention we used some super old skool ‘Lambic Royal Decree’ procedures for this recipe too (Specifically a first and second ‘slims’ routine). To understand this procedure it’s important that I mention our malt bill is built from over 30% Chit, over 30% raw wheat, and less than 60% barley. In this procedure, we do a three step temperature mash, but before the last sachrification step, we collect ~20% of final volume in our kettle and boil it. Doing so denatures the enzymes in that volume locking in a ton of extra starches and proteins. Wild microbes love wort which is high in proteins and starches, so once again we’re completely structuring this recipe to support the production of sour and funky flavors. We’ve also brewed the same exact recipe, but we’re aging it on oak for a full year before release and calling it ‘365 Day Oud Gueuze.’ It will be an unblended ‘old Gueuze.’ We’re moving that batch onto Chardonnay barrels this Saturday, 365 Day will only be brewed once annually, that entire batch will go to 750ml Bottles. If I can find some old cheesie hops I’ll dry hop these barrels with them for the last month of aging. Look to see it available July 2014. This particular version that we’ll see on Friday was not aged in oak, as Jason said above. In a year, we’ll get to try an aged version. Over time, of course, the Brettanomyces will continue breaking down additional sugars so it will be super interesting to see this young version change over time. The beer releases this Friday at Trinity and you should expect to see the beer up and down the Front Range in bars within 2 weeks or so. Trinity Brewing is located at 1466 Garden of the Gods Rd. in Colorado Springs. Brewer’s Rendezvous in Salida this weekend!